Couples who perceive a drop in happiness in the first year after they became parents, have a lower probability of having a second child. A study by the Max Planck Institute for Demographic Research (MPIDR) in Rostock, Germany, has shown that the larger the loss in well-being, the smaller the probability of a second baby. The effect is especially strong for mothers and fathers who are well educated and older. The investigation deals with a taboo subject. It is rarely discussed that parents often experience a considerable loss of happiness after the birth of a first child. The new study shows that for mothers and fathers in Germany the drop in life satisfaction during the year following the first birth is even larger than that caused by unemployment, divorce or the death of a partner. These findings have now been published by Mikko Myrskylä, demographer and new director at the Max Planck Institute for Demographic Research, and Rachel Margolis from the Sociology Department at the University of Western Ontario in the Journal Demography. "Parents' experience with and after the first birth help predict how large the family will be eventually," says Mikko Myrskylä. "Politicians concerned about low birthrates should pay attention to the well-being of new parents around and after the birth of their first child." In order to explore how the birth of the first child influenced parental happiness, the researchers made use of mother's and father's self-reported life satisfaction in the German Socio-Economic Panel Study (SOEP). Every year 20,000 participants assessed their contentedness with life on a scale from zero to ten (maximum well-being). 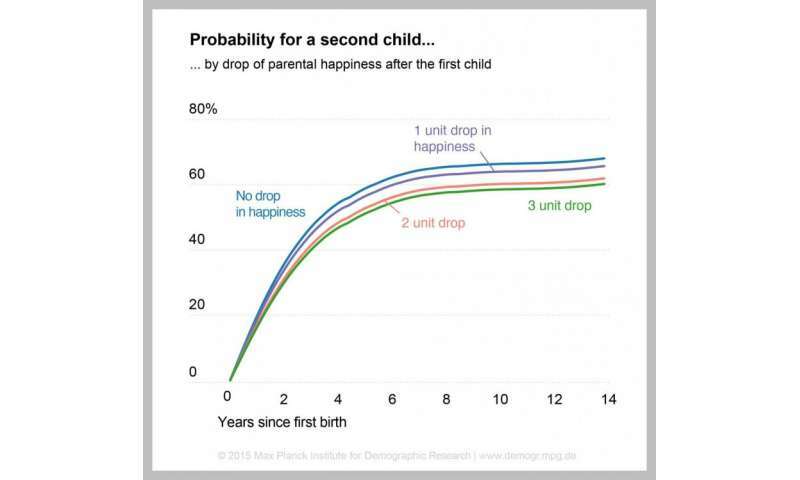 After the first child mothers and fathers reported a loss of well-being that averaged to 1.4 units on the happiness scale. They felt this decline during the first year of parenthood compared to the two years before the birth. Only just under 30 percent of the participants did not feel any decline in well-being. And more than one third experienced a decline of two or more units of happiness. This is notable compared to what international studies find for unemployment or the death of the partner (both with an average loss of one happiness-unit) or for divorce (minus 0.6 units) on the same scale. Calculations done by Myrskylä and Margolis now show how strongly experiences made with the first child affect chances for a second. Only 58 out of one hundred couples who reported a drop in well-being of three units or more had a second child within ten years. But among parents who did not feel a reduction in happiness, 66 out of one hundred couples had another baby. Thus, the share of families with at least four members was almost 14 percent larger if happiness did not decline. These results are independent of income, place of birth, or marital status of the couples.